First, there are standard legal services and processes which can be commoditised and where clients may want to see self-service features. Such legal services can include the drafting of standard commercial contracts and corporate secretarial documents. Second, there are standard processes of a complex nature, such as fund-raising, HR, or corporate governance and company maintenance, as well as issues involving multiple jurisdictions. Third, complex legal advice and services, such as for litigation and arbitration. 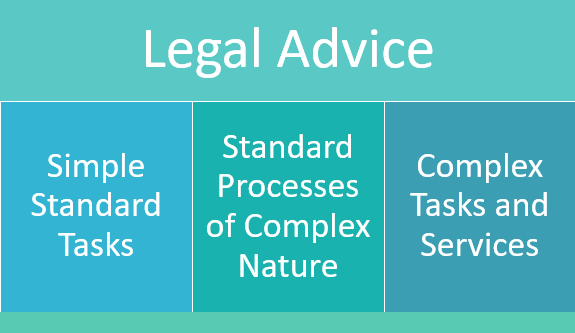 How Zegal sees the entire range of legal services sought by clients, categorised in terms of complexity. Zegal believes that while lawyers remain central to solving complex legal matters, less complex aspects can be performed more efficiently, so as to allow lawyers to focus on higher-value work. At its core, Zegal 2.0 remains an automated contract generation platform. In its latest iteration, however, Zegal has striven to make usability the central theme of its product. During our chat with Stephan, Stephan explained how non-legally trained persons could, without any understanding of laws and regulations, generate legally-compliant standard documents (through a series of guided steps) to achieve their business needs. One example of this ease of usability is the summaries of the function and types of legal documents at the start of the document-creation process. These summaries allow users to choose the parameters that best suits them. For example, for employment agreements, users can specify the type of employee that the agreement will be drafted for (eg. clerical, junior or senior management), as well as customise other related employment conditions. Zegal 2.0 then instantly generates a jurisdictionally-compliant agreement that is tailored based on the customer’s input. Also helpful are the brief blurbs in each empty field, which describe what that field is about and why it is important. Those interested in being able to customise their document even further can choose to do so by downloading the generated document in Word format. This, however, prevents a customer from utilising Zegal 2.0’s other benefits, namely: having structured data, utilising dashboards, online signing, document tracking and guidance, and the in-built process management system (which we explain more below). Other strengths of Zegal 2.0 include security, accessibility (as a cloud-based platform), and product support. Of the last, this includes (if one subscribes for the premium version) user access to an on-demand lawyer from an independent law firm through a live-chat function. This allows users to get answers instantly on questions while working on the document within Zegal, further streamlining the document-generation process. For more complex matters, such as fund-raising exercises, Zegal 2.0 also allows users to work collaboratively by creating a team (including fellow colleagues and lawyers) that collaborates directly through the platform. Users start by selecting from an array of business workflows that they wish to execute legally. The solution then breaks down these processes into easy-to-understand actionable steps, including the option to choose the appropriate contract templates. At each stage, users can also assign tasks to other users in the system, such as their manager or their lawyer to take action, approve or sign certain documents. There is also a review module in which users can comment on certain clauses in the contracts and return it to the user seeking approval for further amendments. The upshot of this is that there is an auditable approval trail, ensuring accountability for business users. On Zegal 2.0, users can easily assign tasks to fellow collaborators working on the same document or project. An in-built comments system within Zegal 2.0 allows collaborators to share comments on the same document. Zegal’s strategy is to focus first on how its technology “wows” clients. The cloud-based SaaS model helps lower the price of access to legal services. Other benefits include predictability, open communication and 24/7 availability. Best of all, clients enjoy peace-of-mind, given that they will only be charged additional fees for the legal services they need most – having the lawyers answer their legal questions, whenever they request it. Revenue generation: In a world where the demand for legal services is relatively price-elastic, a tool like Zegal 2.0 that decreases legal fees would, in fact, increase the amount that the legal industry could potentially earn. But don’t just take it from us – this is backed by basic economics. A quick glance at the diagram below explains why. (through the use of platforms like Zegal 2.0) can result in higher revenue for law firms. A decrease in legal costs will increase the demand for legal services. Stephan believes that this demand is highly price elastic. Therefore, the law firm’s increase in revenue will be more than the loss of revenue induced by decreasing the prices. 2. Increased certainty of income: A subscription-based model would reduce the proportion of revenue-generation that is left to chance and creates a much stickier relationship with those clients as well as multiple touchpoint opportunities with clients. This, in turn, allows for a better (and more positive) valuation of any law firm. 3. Better relationship with clients: When clients are able to get quality legal services at a fraction of a cost they would have otherwise had to pay a law firms (in contrast to the standard hourly-billing model), their consumer satisfaction would increase, increasing client retention and referral rates (and relegate fee disputes to the dustbin of history). Zegal currently has three tiers of subscription plans: Startup ($175 / month), Professional ($350 / month) and Premium ($550 / month). The tiers increase in the range of functionalities, with the premium plan having access to a wide range of documents plus premium functions like the lawyer live-chat function. Notably, these subscription fees are charged to the client, rather than the law firms. This allows law firms to build product offerings for their clients using the Zegal platform, and in doing so create additional revenue streams for their firm, as well as an additional means of serving modern SMEs. With an innovative product, intuitive user interface and tiered subscription plans, Zegal 2.0 presents itself as a forerunner in the new frontier of workflow management and automated document generation software. It improves on its functionality, yet retains simplicity even as one tackles increasingly complex legal documents. As the Zegal team put it, Zegal 2.0 does not phase out lawyers – it saves time for lawyers to focus on the important matters, like building a trusted relationship with the client. Ultimately, this may perhaps be the greatest takeaway for any user of Zegal 2.0. Zegal 2.0 can be accessed at https://zegal.com/en-sg/.